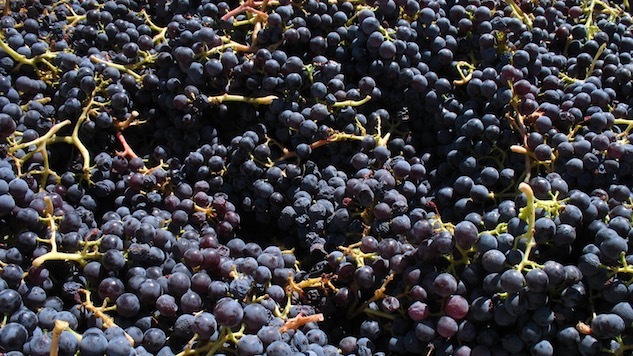 Grenache (or Garnacha, as it is known in its homeland, Spain) is one of the most widely planted grapes in the world. Late-ripening, heat-loving, drought-tolerant and sturdy (its tenacious, structured wood canopy makes it very wind resistant), it’s generally likely to produce light-colored, soft-textured, low-acid and high alcohol wines (it’s often blended with Syrah and Mourvedre to give tannic structure and a stronger color). It’s one of those grapes that flies low on the radar even though it is the main ingredient of a lot of stuff you probably like, including Priorat, Chateauneuf-du-Pape, and a whole lot of those rosés from the south of France (notably but far from exclusively anything labeled “Tavel”). Grenache loves Spain and southern France, but it is also found in Australia, Israel, South Africa and in Sicily and Sardinia, where it is known as Cannonau. In California, it is relatively ignored (though the Central Valley has historically produced a ton of it, often in the form of really hot, headache-in-a-bottle pinks). Good Grenache is soft-bodied, sometimes silky, and has a spicy character (pepper and cinnamon) with an overlay of roses and red fruits (raspberry most often). With age, it’s common for notes of tar or tobacco to appear. In some regions, it tends to develop an orange rind characteristic; in others, it’s uncommon. Grenache can be a great summer red (or pink, or white-it has a green-skinned morph known unsurprisingly as Grenache Blanc or Garnacha Blanca. Grenache Gris is a pale-red morph that is most often produced as a rosé). It loves grilled meats, handles summer vegetables with aplomb, and stands up well to chili pepper, possibly because it’s relatively high-alcohol. In its pink iterations it is a drag-and-drop food wine and also perfectly lovely as a standalone paired with warm, sultry weather. Bring it, summer. The 2017 release is, like its predecessors, a Grenache-fest made in the dry and light Provence style. Vegetarians and lovers of shellfish take note, this is a wine that will pair with some of the more difficult-to-pair veggies (and spices!) but it handles simple stuff just fine too. Ethereal, delicate, acidity in the “racy” or “zippy” range balanced with strong mineral presence. Tangerine, pomegranate, a ghostly floral note that might be almond or peach blossom. Epic deliciousness. This rosato is composed of four Sardinian grapes that are ideally suited to rosé styles. Cannonau (one of many aliases for Grenache) and Monica lend strawberry fruitiness, while Carignano and Bovale Sardo bring freshness and aroma. Serra Lori is a beautiful rosy-pink wine full of juicy, vibrant raspberry and alpine strawberry flavors. It’s vivacious and affable and while it can certainly stand on its own, it’s a wine that’s happiest paired with a bunch of friends and a nice dinner party. It is a fan of outdoor cookery, and will hang out happily with grilled veggies, oily fish-it has enough body and structure to hold its own with grilled meats of the red variety. Chateau de Berne makes a lot of pretty wines in pretty bottles, including this Grenache-forward one, which has slightly unusual amber-yellow reflexes in the glass. Structured and fairly weighty, it’s characterized by light cherry and pomegranate notes with a long, strong strawberry finish anchored by excellent minerality. The word “crisp” gets thrown around a lot with French pinks but I’m not going to do it here. This wine is full, soft, luxuriant on the palate and relatively rich. Dry Creek Valley is probably best known for Zinfandel but for the same reasons, Grenache can thrive there on the stony soils and combination of hot days and cool evenings. Native yeast fermentation and large format oak barrels give this wine a feisty, slightly untamed character. It’s slightly rusty in color and has dominant notes of raspberry, pomegranate and cinnamon on the nose; on the palate these are reinforced along with sub-notes of violets, lavender and strawberry. The finish is peppery and lingering. Like many Dry Creek wines, this guy is very interested in summery BBQ items. Donkey and Goat is an urban winery in the unlikely locale of Berkeley, CA, and this fruit came from a couple hours north in Mendocino County. Very aromatic, largely a wild strawberry fest but also prominently citrusy (mandarin, mostly). Wonderfully balanced. Not shy. Medium-bodied, super dry, and a friend to many pasta dishes. This Catalan Garnatxa has bright, vivid acidity, slate-like minerality, and dense red fruit-layers of cherry, raspberry, currant and strawberry. Bracing, balanced, awesome.